Apparently the seller that I purchased this book from did not actually have it in stock, so I was refunded the cost. This book is not just for history buffs, as it doesn't get bogged down in statistics, and minute facts.You get the idea of what WW I was about, but in capsulated form. A terrific summary -- "just the facts"
Here we have a straight-forward version of the complete history of WW I, told in a very readable manner. Not much is omitted in terms of politics and/or battles but Stokesbury has managed to limit this work to 348 pages including the useful index. I bought this book when it first came out in 1981 and read it right away. I have read it since that time as well and found it to be a great repository of facts concerning this monumental conflict. There are four or five nice line maps which reflect changing events during the war and the softcover binding makes this one easy to take along to the doctor's office. The fonts are also plenty large enough to read in comfort. If you're looking to expand your knowledge of 20th Century Europe and/or of "The Great War," I cannot think of a better investment than Stokesbury's competent rendering of this fascinating topic. way too detailed for this reader seeking significant causes, major events and overall resolution. With unusual clarity and "from the trenches" insights, this book explores in detail the complexities of the origins, course, and momentous effects of World War I. It focuses not only on the grand scale of the war, but on its everyday realities for the common soldier and the civilian populations on the Western, Eastern, and other fronts. Explores the military and non-military aspects of the War and its causes. Synthesizes various analyses and interpretations of the many controversies of the war. Includes insights from the most recent literature on the role of women in the conflict; the war in the air; the Armenian Genocide; the assassination of Archduke Francis Ferdinand; Total War and the Home Fronts. Contains a graphic, in-depth account of the appalling existence of soldiers at the front -- including not only the horrors of battle, but the oppressive psychological impact of life in the trenches. Features a large number of maps and lively biographical sketches of important figures. For anyone interested in World War I, Military History, 20th Century Europe. 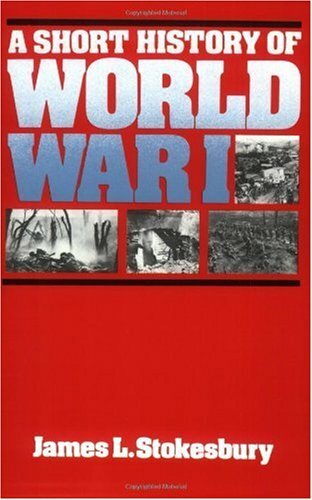 World War I, A Short History is one book that certainly can be judged by its cover, it is a no frills statement of all facts concerning World War I from its causes to its consequences, it is accurate, detailed and has a refreshing lack of personal opinion. 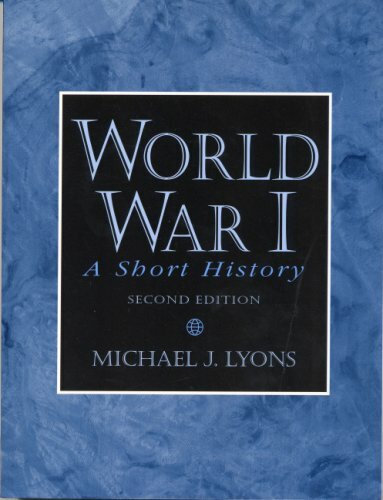 Do to its overwhelming detail and lack of personal opinion Lyons's book is best suited not as a class room text but as a stand alone resource of the First World War. There is no doubt of Lyons in depth knowledge of his subject but the comprehensive manner in witch he presents it makes the book no light reading, careful note taking is required in order to make the most out of the information that Lyons presents, despite this inconvenience the book is still a valuable resource. These are first hand accounts of men and women that lived through the first world war.It is all there--loyalty to your fellow soldiers, cowardice, indifferent heroism, terror, and the feelingof apartheid from home and family.The most striking rememberances I took from the book were the white feather incidents--where white feathers were given to soldiers out of uniform on leave in England by young women as a goad to get to the trenches. This is the first book I've ever read in one day; 'I rest my case'. My most lingering memory is the story of the soldier who was shot for 'losing his way' and not showing up for a battle. When offered brandy by the narrator before meeting his maker, he said he'd 'never drunk spirits and wasn't going to start now'. Not such a coward, after all. This book is full of fascinating wartime anecdotes given by the soldiers fighting it and the citizens involved in it.The staff of the UK's Imperial War Museum sifted through mountains of archives and picked out the very best to use in the book.Through the use of their own personal letters/interviews, the book follows the history of particular, mostly British, individuals during the war.It loosely follows the major battles of the Western Front and Gallipoli and even the Home Front. Most of the letters vary in length between one paragraph and one page and are packed with the kind of realistic details that typical narrative histories of the World War I skip over.For example, in Gallipoli (p. 118) one soldier writes, "One of the biggest curses was flies.Millions and millions of flies. ... Immediately you bared any part of your body you were smothered. "Short of actually being there, these kind of first person participant narratives deliver the essence of the war - harsh, demanding, brutal, comedic, and ocassionally surreal.The straightforward writing styles and unusual content make this book a true pleasure to read. 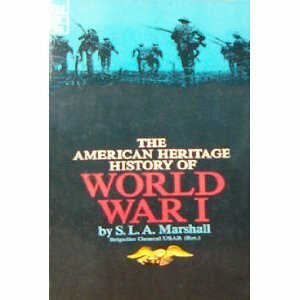 I have read over 40 books about the Great War, and this book is one of the best for personal narratives about the war.It's multi-person perspective delivers a well-balanced, insightful picture of the war at ground level (free of any hidden agenda).This book would perfectly complement a broad narrative history of World War I.
Max Arthur's new book covering the Great War is quite unique in that its content is nearly all first-hand accounts from people who experienced the horror of the Great War. The author has utilized a number of tape recorded interviews conducted by the Imperial War Museum in 1972. Many of the tapes from the Imperial War Museum Sound Archive had been forgotten and left unheard for years. 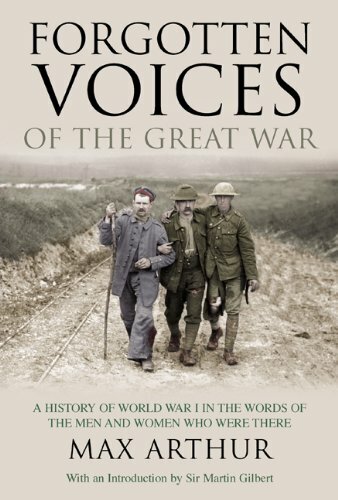 Now Max Arthur has put together many of these unheard voices from the Great War to produce this spellbinding and captivating book. I must admit that I was reluctant to buy this book as I was worried that a book full of short accounts would be too disjointed and really not detailed enough to satisfy my interest. I can honestly say that I truly enjoyed reading this book. 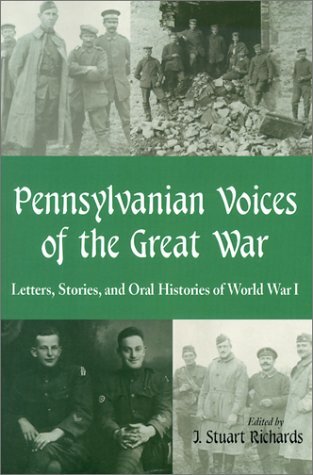 Each chapter of the book was a year of the Great War and was commenced by an introduction by the author offering a brief run down on the major events of that year. Then we heard from the men and women who participated in these events, from both sides of no-man's land. The author has concentrated mainly on the Western Front and Gallipoli and has tried to run the oral segments in chronological order. This is an awesome book! Someone should have done this sort of thing a long time ago for the WWI era. 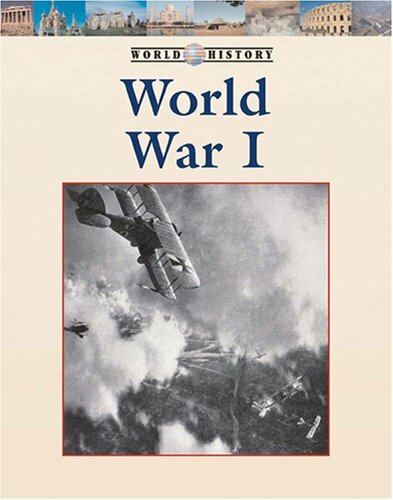 This is the first of the books in this series that I've read but it takes topics in WWI history which are otherwise forgotten or treated as footnotes in other histories of the Great War and discusses their campaigns at length, including sidebars, photos, maps and other illustrations to bring the subject to life. The fighting in the Balkans is done very well, covering the initial, unsuccessful Austrian campaigns to wipe out Serbia early in the war, the final campaign (which was a combined Central Powers effort which saw German, Austro-Hungarian and Bulgarian forces employed) that resulted in Serbia's crushing defeat and the continuance of the war from the Salonika Front, an effort made confusing by the range of Allied forces arrayed there and the political environment in which war was fought. I was disappointed that the Montegrin Army is mentioned but no discussion of its role in the Allied effort ever comes up. Then there's Africa. Of course, the book concentrates on the war fought in east Africa and little is said of the Allied effort against Germany's other colonies in Africa, but the effort against von Lettow-Vorbeck was the main affort and the longest-running one at that. There are a few aspects of fighting in Africa that could have been done better in my opinion but the entire book is not devoted to this topic. Overall, a good sketch of this campaign. Finally there's the Italian front. The author discuses the diplomatic machinations which led to Italy entering the war on the Allied side (by its prewar treaty obligations, Italy really should have fought on the side of the Central Powers)and the domestic politics which resulted in a declaration of war. The book does a good job of looking at the fighting done between (primarily) the Italians and the Hungarians following Italy's entry in the war on the Allied side. This book really gives you a sense of the horrendous conditions that soldiers fought in the valleys and mountains of the frontier. 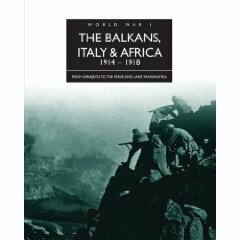 Author David Jordan wraps up the book with a chapter about the collapse of the Central Powers in the Balkans and on the Italian Front. Jordan's crisp prose, non-political viewpoint, and meticulous research take us on a chronological ride through the military campaigns in Serbia, the Salonika front, German East Africa, and Italy in turn.He makes use of a variety of maps, some sidebar information on the major personalities of the campaigns in question, and a great number of excellent photographs and illustrations.The maps could be a little better as the text refers to vast numbers of smaller towns and locations, valleys and rivers, that are often not shown on the maps provided; but otherwise the whole package is outstanding. Von Lettow-Vorbeck's exploits in German East Africa are relatively well known and always make for fascinating reading; but as for the other fronts covered here, incompetence, frustration, mindless carnage for meaningless gain, and political meddling to ill effect are the order of the day.Cadorna's endless offensives on the Isonzo, for example, are covered in great detail; Austria's bumbling and expensive attempts to subdue Serbia are covered on almost a day-by-day basis; the ill-considered Anglo-French Salonika front was sabotaged by constant poor leadership and judgement, and the text covers the infighting and conflicts well.Jordan throughout is well informed, and writes well and without moralizing about the disasters that form the subject of the book. If these theaters of World War I are less well known to you than those of France or Russia, you should pick this book up.I found it informative, very well written, detailed, and beautifully produced. When the United States entered World War I in 1917, it sent the American Expeditionary Force to relieve the worn and beleaguered Allied Forces. On September 20, 1917, Congress approved the creation of the Second Division of the American Expeditionary Force. A hybrid Marine/Army unit, it was conceived and ultimately formed overseas, primarily from units in France. Giving themselves the nickname "Second to None," the Second Division effectively stopped the German drive on Paris in June 1918, becoming the first American unit to fight the enemy in a major engagement and revitalizing the Allied war effort. a synopis of the First World War. This is a good book for an overview of World War I.Baldwin does an adequate job of reviewing all the theaters of war.Some histories of the war don't cover the Russian, Italian, Bulgarian, and Middle East theaters, but Baldwin gives all equal weight.Thus the reader will have an insight into not only the Western Front, but the politics and battles elsewhere. Baldwin states this is an outline history.This is what the reader will find if he reads this book.No individual stories will appear here, just the outline of the war.Baldwin also limits his own opinion in the book. World War I. An Outline History is precisely what its title suggests. A short, concise and objective recounting of the events leading to, during and succeeding the First World War. The book is an attempt to tell the First World War in the briefest of ways. Hansom W Baldwin was a distinguished war correspondent in World War II and eventually peaked his career as the Chief Editor of the New York Times. He has authored several books on war including The Navy at War, Great Mistakes of the War and The Price of Power. His first love was for the Navy and that had been due to his rearing up in Annapolis near the US Naval Academy. The book is primarily aimed for the layman to get a self contained understanding of the immediate causes, the progress and outcome of battles and the aftermath of allied victory and axis defeat in the First World War. It has been interspersed with useful political and military analysis to allow the reader a revealing understanding of the war without burdening him with unnecessary detail. The book can functionally be divided in two parts. One functional objective is to provide the essentially needed historical background and analysis to put the various events connected with the First World War in correct perspective. The second objective is to provide the reader the actual events, battles and campaigns in an easily comprehendible chronological order starting from 1914 to 1918. In the first chapter the historical background, political situation in the continent, the continental power structure and the strengths and weaknesses of the key personalities of the time are described. This chapter takes the average reader to a take off point where the subsequent narration of events becomes interesting. In the same vein the last chapter succinctly summarizes the political fallout of the war both on the victors and the vanquished. It also then furnishes the effects these events had in subsequent times. Chapters II to VI respectively deal with each year of the war. By devoting one chapter for each year of the war, the author has attempted to highlight the singular events of that year in perspective and at the same time keep the narrative coherent. The recounting of the famous German Schiefflin Plan in Chapter II and its modification by Moltke is notable. The new weapons of war; gas, aircraft and tanks find mention at the appropriate location. Their initial employment doctrine and effects are also explained in easy layman terms. Naval battles and operations in outer theatres like Middle East, Africa and the Balkans is given in brevity even by standards of this book. The writing style is brisk and blithe that makes for an enjoyable reading. Chapter I and VI is a must read for the incisive comments on the political situation e.g." Nationalism and the desire for self-determination flamed brightly long before the canons spoke in 1914." Is a typical way how the author intersperses metaphors to make the reader aware of the underlying currents as well as make the reading a pleasure. Focus has primarily been on reviewing grand strategy of both sides while tactical detail is only given piecemeal wherever it may have become necessary for explanation of either a defeat or to explain subsequent evolution in strategy, tactics or political thought. The book can be found interesting alone for its comments on leading personalities of the war. Weaknesses of Joffre, Haig, Kaiser, Czar Nicholas, Moltke, and George Lloyd etc are exposed to bring home the importance of the difference the personality factor can bring in the outcome of war. A bias can be found in the writer against the Austrians and Italians in the way they have been treated in the book. The author has adopted a style suited for the average reader, probably to a great degree as a result of his experience as a journalist well versed in the art of mass communication. The book will be a good starting point for any reader who wishes to quickly grasp an outline history of the First World War but this book will not serve the purpose of a serious student interested in a more rigorous and academic treatment of the history of the First World War as would be done by a professional historian. Traditionally studies of the naval battles of the First World War have focused primarily on the non-event of the confrontation between the British and German battle fleets in the North Sea.While relevant in the context of the tensions that led to war and important for several reasons, such predominance creates a distorted impression of the war at sea as being one that was mainly fought around the waters off Great Britain.In fact, the naval history of the First World War is one that well justifies the title of the conflict overall, as ships of the various sides fought each other in critical struggles across every part of the globe. In this respect, Paul Halpern is the ideal person to write an overall history of the conflict at sea.A longtime naval historian of the era, he approaches the subject from his earlier work studying the First World War in the Mediterranean, a long-overlooked front that engaged many navies not traditionally covered in histories of the war.This equips him with a background and perspective that is perfectly suited for a broader study of the naval history of the war, one that he displays on nearly every page.Beginning with a short survey of the navies of the major powers, he goes on to discuss the exciting pursuits of the first months of the war before taking the reader on a tour of the many neglected fronts, from the Black Sea to the Danube River.To accomplish this, he draws upon his own considerable work as well as many of the often-neglected official histories and memoirs, many of which require the surmounting of numerous language barriers. The war that emerges within these pages is not a staid affair of massive dreadnoughts glaring at each other from their respective ports, but a series of struggles of cruisers, destroyers, submarines, and river boats often characterized by dash and ingenuity.Though Halpern recounts many of these clashes, his focus is primarily strategic, as he explains how each of these battles and campaigns played a role in the broader effort by the various sides to win the war.His analysis is insightful, explaining why these oft-ignored struggles mattered in the grand scheme of conflict.Nor does he overlook the traditional subject of the stand-off between the Grand and High Sea Fleets, giving them due attention as a critical component of his topic. All of this makes Halpern's book a truly impressive study of the First World War at sea.Encompassing as it does issues of geography, diplomacy, and society, it is indeed not just an account of battles and campaigns but a real naval history of the conflict.Such an inclusive scope can make it easy to quibble about minor errors such as typos, or about what was left out (my personal complaint is the lack of a concluding chapter examining some of the post-war consequences of the experiences he describes), but none of this should overshadow the magnificence of Halpern's achievement.Simply put, this is the single best history of the naval conflicts of the First World War, one that is an indispensable starting point for understanding the conflicts at sea and the role it played in the war overall. This book covers the entire range of naval warfare during The Great War, including many arenas not normally considered important.While most histories concentrate on the British struggles with the German Imperial Navy in the North Sea, Halpern broadens his scope to include all of the basic naval events.He writes that "this was indeed a world war, and naval operations took place throughout the world and were conducted by many navies" (p. xi).He includes chapters on the submarine aspect of the war, the air war against the submarines, and the major battles like Jutland and the Dardenelles. I was particularly surprised to read about the claim for Russian naval superiority in the Black Sea region, since I had previously assumed that the Germans and British were dominant everywhere, from the North Sea to their colonial battles in the Atlantic and the Pacific.Russian amphibious operations in 1916 were uniformly successful, although "there is no comparison between the problems the Russians faced and the fierce resistance the Allies met when they landed on the Gallipoli Peninsula" (p. 245).But revolution and subsequent civil war at home brought an end to major Russian involvement in the war, including their naval operations. According to Halpern, Gallipoli itself, arguably the most famous failed amphibious operation in world history, was actually not due to the failure of British submarines to sink opposing vessels, as some have speculated.Instead he insists that their "exploits...were...the proudest and most successful aspect of the Dardenelles campaign" (p. 119), and that it was the determined Turkish resistance that led to disaster and the fall of the British First Lord of the Admiralty, Winston Churchill. The original absence of a German naval strategy ultimately led to the Imperial Navy stumbling "into the submarine war against commerce" (p. 291).The problem was that submarines could not spare men to man captured vessels.They had to be sunk, and for the crews of these ships this meant a watery grave.There was simply no room to spare for prisoners.This policy did not please the Allies one bit, and the British launched an all-out campaign to end German submarine dominance of the seas.Surprisingly, Japan played an important role in the war against the Germans.They aided the British by sending "fourteen destroyers at a critical moment in the war against submarines (p. 393), and received high praise from London as a result. "A Naval History of World War I" challenges many long-held assumptions about the importance of naval operations outside of the North Sea, and may revolutionize the established thinking on the subject.The naval events of the Great War were more complex and important than they are generally seen as being, even among historians, and this tome provides a good general treatment of their vagaries and vicissitudes.After all, we cannot understand World War II and recent twentieth century naval history without a proper context to put it all in.This book is a great place to start.I heartily recommend it to the general public, as well as to students of the Great War and lovers of naval and maritime history. I bought this for my father a few years ago for his birthday. I opened to a random page and read an engagement which had been an oral history in my family. I never knew my grandfather, but I felt closer to him after reading about some engagements his ship was in. Paul Halpern is a refreshingly independent thinker. No one else has managed to write 500 pages on the subject of 1914-18 naval warfare without mentioning Admiral Alfred Mahan. And although he has had to compress mightily to fit that history within 500 pages, he still finds it worthwhile to mention such illuminating, if pointless, incidents as the Royal Navy's cattle raids in Turkey in 1916. World War I was, as has so often been noted, the great divide between the premodern world and the modern one. Nothing says so more eloquently than this little anecdote about how the Royal Navy, owner of the most advanced machines yet seen on the planet, thought it necessary to practice the kind of warfare that Homer's Greeks had . Although Halpern, professor at Florida State University, says he has had to neglect the crucial topic of logistics to fit his history into a manageable volume, in fact he presents a better discussion of the influence of bases, ships and supplies than most general histories do. His excellent chapter four, on the usually underserved Pacific war, demonstrates this. The allotment of ships and the location of bases in late 1914, along with certain decisions about troop movements, determined why some islanders today eat canned corned beef and look to New Zealand for jobs and higher education, while others eat Spam and look to the United States. And why other islanders had to suffer great hardships in 1941-45. But these minor events had major consequences in 1944. They determined that some islanders would be starved by blockade and blasted by naval and air bombardments, while others were not. Halpern's description of the 'minor' events is fuller than in any other general history I know. Despite a crowded agenda, he exploits to the full the romantic stories of the naval war in the Pacific, like the famous raid of the cruiser Emden, and the horrifying stories, such as the Battle of Coronel, where a ship manned with hundreds of reservists from a single Scottish town went down with all hands. Based on previously unused French and German sources, this challenging and controversial new analysis of the war on the Western front from 1914 to 1918 reveals how and why the Germans won the major battles with one-half to one-third fewer casualties than the Allies, and how American troops in 1918 saved the Allies from defeat and a negotiated peace with the Germans. This book, as it title suggests, takes a refreshingly different tack from the consensus of most WWI historians. 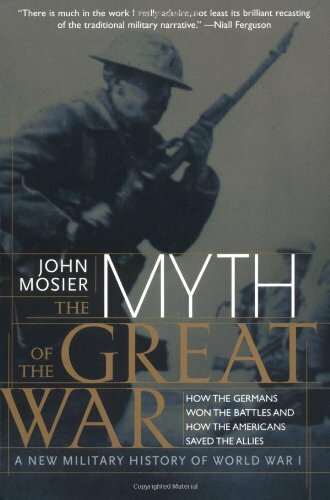 Mosier argues that the Central Powers (Germany, Austro-Hungary, Bulgaria, and Turkey) by 1918 had won on all fronts and lost significantly less men over four years of fighting than had the allies. He maintains that neither France nor Britain had viable combat forces able to continue the struggle against Germany and were themselves on the point of collapse.Mosier also claims that only the timely arrival of a million man U.S. Army saved the allies and administered a major defeat on German Forces in the Western Front that in turn led them to ask for an Armistice. Many historians will dispute these claims, but Mosier marshals a somewhat impressive case for his conclusions. History is very much a matter of analysis and interpretation. While Mosier's overall thesis certainly appears possible, many of his specific assertions in support of it are wrong or misleading. At one point, for example, he flatly asserts that the British heavy tank (the Marks I through V) was useless on the battlefield. A point he later contradicts by noting the Germans were able salvage and employ many UK tanks found on the battlefield. He also notes the poor performance of the French heavy tanks, but does not mention that the French made effective use of the Renault F17 light two man tank. His assessment of the 1917 Battle of Cambrai as a complete catastrophe for the UK is just plan wrong. The initial phase of the battle employing 378 tanks on suitable ground and supported by infantry was a complete success, unfortunately the British High Command was not prepared for such a success and did not have a plan to feed reserves into the newly captured territory and the Germans were able to recapture the ground lost. Similarly the 1918 Battle of Amiens was a real battle with the British using a very effective combined arms concept involving quite sophisticated use of tanks (including the newly developed Medium A), artillery,infantry, horse cavalry, and aircraft working as a team. Mosier's claim that the battle was really nothing of the kind because the Germans were already withdrawing is again wrong as evidenced when he notes the high number of UK casualties that resulted from this `non-battle' which Ludendorff referred to as a "black day for the German Army." In the end it is hard not to suspect that Mosier developed his thesis first then tried to shape the evidence to prove it. He would have been better advised to try for more balanced and accurate evidence. My actual rating for this book is 3.5 stars.I've read some of the one & two-star review for this book, & most of them have one thing in common: They were written by people from England.You can tell by the way they spell certain words (i.e. "favour" as opposed to "favor").There has been a renewed interest in World War I in Britain over the past few years.British TV has even done specials on the battle of the Somme recently.England lost an enormous number of men during the First World War, so you can understand their sensitivity to the idea of Americans "saving" the Allies.However, there are certain unmistakable truths that John Mosier brings to light which cannot be denied.Mosier's critics say that he didn't really know much about the First World War before he began researching for this book.Well just because you don't know about something doesn't mean you can't learn.And Mosier spent ten years researching for this book.Each chapter ends with an extensive bibliography.For the most part he only writes about the Western Front.However, when he does write about other fronts, he does so in a way that shows how events on those fronts impacted the Western Front.For example, Mosier discusses how the Allies bribed Romania into joining the war as a means of drawing German resources away from the Western Front. 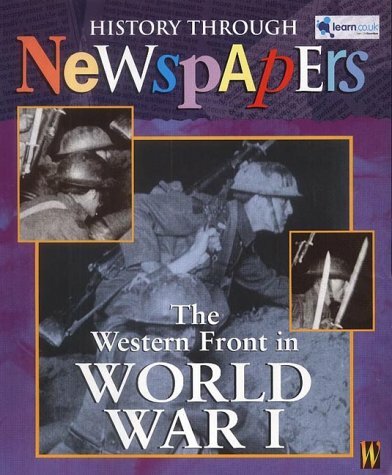 I gave the book 3.5 stars because it does have some flaws.Mosier's writing style comes off as being a bit amateurish at times, & he often repeats himself.His map on Page 76 shows where the German line was on June 15, 1914.Since the war didn't break out until early August (1914), Mosier's editor or publisher should have caught this mistake. I do like this book though because it made me question everything I had previously learned about World War I.I've been studying the First World War since I was in elementary school, & Mosier discusses battles in his book that I had never heard of before (Woevre Plain, Les Eparges, Vauquios & Hartmannswillerkopf).Were these insignificant battles?Or were these battles that determined the future course of the war? How important was the mission of Lieutenant Colonel Hentsch?Mosier lays out the case that the Germans weren't driven back at the Marne in September 1914, but rather they engaged in a strategic withdrawal.And if they were so soundly beaten at the Marne, why did they promptly turn around & attack through the Argonne?How important were the tactics of General Von Mudra? Mosier states that the British & the French never really understood how to fight this war.His critics will tell you that they did learn how to fight the war from 1916 onwards.If this is true, why were their losses so high right up to the very end of the war?If you've learned how to fight your enemy, shouldn't your casualty rates be going down instead of remaining constant (or even going up)?Also, when the war ended, the Germans were everywhere still on French & Belgian soil.If the Allies truly were victors, shouldn't the war have ended on German soil?Shouldn't German cities have been reduced to rubble? I read Mosier's book after having read his other two, "Cross of Iron" and the "Blitzkrieg Myth. "Thus, I was prepared for a fresh lookat old well trodden terrain. For the most part, I was not disappointed, at least during the first two-thirds of the book. Mosier's use of French and German sources, especially the cold statistical comparisons of KIA, gives compelling corroboration to his conclusions of German military excellence at all levels of warfare on the one hand, especially the institutional ability of the German Army to adapt to changing conditions of war, and British and French mediocrity, on the other. It is when Mosier gets to the closing part of his book that he taints what was until then shaping up to be a masterpiece. His attempt to convince the reader that American excellence in combat defeated the Germans, while ignoring the final efforts of the British and French, goes too far. As a former Marine, I cling to the warm emotions conjured up by the exploits of the Marine Brigade at Belleau Wood. Nonetheless, I realize that it was intestinal fortitutude, aggressiveness, marksmanship and the highest casualty rates in American history that bought American success - not doctrinal, tactical or operational skill. (The same qualities that the professional BEF possessed in abundance in 1914-1915 but lost through the bloodletting over the course of four years). Without doubt, the realization that millions of enthusiastic American troops were pouring into France caused Ludendorff to throw in the towel, not their professionalism. However, I agree with Mosier that the English delude themselves when they claim that the offensive at Amiens knocked the Germans out of the war. The German Army was still intact and on French soil with the signing of the Armistice. It would have fought on as ruthlessly and efficiently as ever if it had to defend Germany. Earlier in the Spring of 1918 Britain suffered its worst military defeat up to that point (France 1940 was still decades away) when the Germans destroyed one British Army and bloodied another in the Michael offensive, all within a few days. In fact, the French had to shift reserves laterally to save the Brits. If it wasn't for the respite gained by the influx of the AEF into the front lines, the BEF would have been in no shape to launch its last offensive in the Fall of 1918. In that regard, Mosier does history a favor by forcing a serious reasessment of what truly became the myth of the Great War. Initially I was going to give this book 4 stars, but since most of the information that the author bases this book on has not yet become general knowledge, as can be witnessed by a large number of other reviews of this book, I decided on 5 stars in the hope of drawing attention not only to this but many other books, dealing with this war that document hitherto generally unreported information. 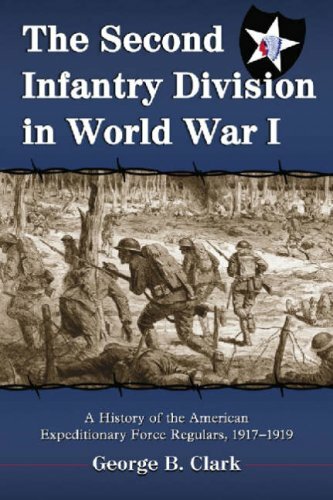 For me the chief strength of this book lies in the fact that its basic premises are independently corroborated by in depth U.S. military analysis and studies done since the end of WWI. A reasonable expectation, based on all available evidence, is that the war would have ended with a negotiated peace in 1916 if not for the fact, among others, that within four months of the beginning of the war, the allies, chiefly England and France, were spending in the United States (using 1990 adjusted monetary value) well in excess of one billion U.S. dollars per week in military goods and services. This expenditure lasted from approximately January of 1915 to December of 1917, by which time the well was truly beginning to run dry. This was the main reason that England, at the beginning of the war, the worlds premier economic superpower, ended as a debtor nation thus crippling its empire. This massive economic windfall along with a historically unprecedented propaganda campaign targeting the United States led the Allied governments to believe that it would be impossible for the U.S. not to join them against the Central powers. It was this belief that was the foundation for the wars extension beyond 1916. In the event this belief was justified. While there are many individual points that can be argued the overall direction of the book is correct. Due to the geographical position of Germany the german armed forces necessarily embraced doctrinal innovation and practice to a much higher degree than other nations and consequently were able to maintain a greater degree of military excellence than their opponents. A point that is continually overlooked in histories of this conflict is that the german military forces, in the west, were always outnumbered by the french and british forces because the bulk of the german army was fighting in Russia. They could shift forces around to obtain local numerical superiority or more often parity, but they did not have the numbers they really needed until Russia was out of the war. The American military was able to push the German forces back chiefly by trading treasure and blood for blood. This is why the U.S. world war one casualty rate was higher than any other armed conflict in which the U.S. was involved, with the exception of the death total for both sides during the the American Civil War. Put a different way the daily number of casualties, KIA, MIA and wounded, were greater than any other conflict that involved American troops. To the best of my knowledge no in depth history of the breakdown of command leadership in germany during this period has been written. If the german military staff structure had been operating as it had at the beginning or the middle of the war, Ludendorff and Hindenburg would have been replaced as a matter of course after the bogging down of the March 1918 offensive. Obviously something had changed the german administrative system during the months leading up to this period. Another little realized fact is that with the exception of the United States, World War One ended in June, 1919 while the U.S. concluded a separate peace with Germany in August of 1921. This book is an excellent counterpoint to the majority of histories that have been churned out since the end of WWI. Equally recommended would be Niall Fergusons "Pity of War". For those interested in the aviation aspect of this war, "Bloody April Black September", by Franks, Guest and Bailey, and "Sclachtflieger" by D.S. Abbot are also must reads. If you've read about any part of World War One before, you know there aren't a lot of happy stories from the war.This book highlights the shockingly poor leadership of the French and British Armies which led to countless thousands of deaths.The book documents how British and French wartime propaganda has made it into offical histories up until now: The British and French always maintained that however bad their losses were that they were bleeding the Germans dry.The author examines known casualty figures along with other sources to show that the German Army set the agenda on the Western Front from the beginning until the American intervention. The author basically documents the German Army running circles around the British and French Armies throughout the war.Part of the author's thesis is that the Germans were smarter in their planning at all levels and were able to use smart planning and tactics to suffer significantly fewer casualties while accomplishing their objectives in most cases. The book concentrates almost exclusively on the Western Front.It is a focused history, which considering the scope of World War One, is not a bad thing at all. The book barely mentions the Americans until the last couple of chapters of the book, so it is not an overwhelmingly American focused book.However, the American intervention is stated as the only way the Allies won the war.The fact is true but is also often obscured. Offering a comprehensive account of the war as more than a purely military phenomenon, World War I: A History in Documents, Second Edition, also addresses its profound social, cultural, and economic implications. 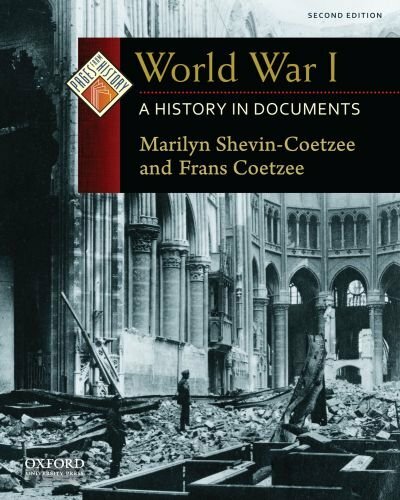 Authors Marilyn Shevin-Coetzee and Frans Coetzee use editorials, memoirs, newspaper articles, poems, and letters to re-create the many facets of the war. Technological developments such as the machine gun and barbed wire brought the world trench warfare, which is vividly depicted here in a firsthand account of then-soldier Benito Mussolini. An Atlantic Monthly essay by the African-American sociologist W.E.B. Du Bois draws attention to the conflict's origins in imperialist greed in Africa. A poor French girl's thank-you note to a charitable American demonstrates the plight of Europe's children. And a photo essay of poster art reveals the passion and propaganda aroused on every side. "I guess you all are wondering where I am May. Well many miles away and settled at last and ready for some hard work. The sooner we get into it the quicker it is going to be over and all admit that it is up to America to finish the job and what I have been able to hear, they think it will be over in two or three months. Well the sooner the better now that we have come this far. Have sure traveled some and will have loads to tell you when I come home."—Lt. W. Ellsworth Gregory. 17. Great Courses Modern History World War I: The "Great War"
FORGOTTEN VOICES OF THE GREAT WAR is a touching, searing, and above all mesmerizing account of World War I, told in the voices of those who endured the tedium, heat, cold, pain, fear, and loss of the world's most brutal trench warfare to date. In 1972 the British Imperial War Museum set about the momentous task of tracing ordinary veterans of the First World War and interviewing them in detail about their experiences. The Imperial War Museum Sound Archive, which includes recorded firsthand accounts of the experiences of American, British, Canadian, French, and German soldiers, as well as soldiers from the British Commonwealth, has since grown to be the most important collection of its kind in the world. The archive's recordings provide a vivid and compelling account of day-to-day life during one of the most harrowing periods of modern times. These recordings, many of which have remained unheard for decades, contain the forgotten voices of a generation no longer with us. Only a small fraction of the material has been used by historians. Now, thirty years later, after hundreds of hours in the archive and unlimited access to the complete WWI audiotapes, acclaimed author Max Arthur and his team of researchers have created this remarkable landmark history of the Great War-told in the words of the ordinary men and women who experienced it in the raw. This is mostly from interviews from British and Australian troops who lived through the war.It is amazing to hear what they went through, in wars since the warriors were almost spoiled in comparison.I have read everything on Vietnam and world war 2, here they lost more men in one day of one attack then in the whole 15 years of Vietnam.That they could continually follow the orders that were nothing less than suicidal are beyond me. I recommend for anyone interested in first person stories of this or any other war to educate yourself on what it was like with this book. A fantastic read.This is not a story book this is real thoughts from real people in a very real war. This book really takes you into the minds and souls of those very very brave men & Women. Excellent.The only reason I did not give this 5 stars is that the book could have been longer.My only grievence.Thanks to the brave who lost their lives. Long may their memory live. Detailed descriptions of great battles and campaigns and after battle reports are good and certainly worthwhile, but this work is just as important, if not more important in some ways, than the first mentioned.This is a collection, taken primarily from original tapes, of the recollections of those who were actually there.As one reviewer has already pointed out, most of these observations were made by those actually in the trenches, actually working on the home front, and not just the recollections of Generals,leaders and journalists.This is quite refreshing and informative.The author has, as much as possible, kept the recollections in chronological order and has given us a brief history before each segment.Some of the recollections are quite mundane, but in being so, make them that much more special. The many black and white photos added much.The only problem I had with the book was that each nationality represented here have used their own colloquialisms, many of which I had never encountered before.But...this actually, in the end, was an advantage for me personally, as it forced me, due to pure curiosity, to do further research and find out just what they were referring to.I learned much this way!Most, if not all, of this generation is gone now and we are quite fortunate to have records such as this.I hope there are more to come.Overall I highly recommend.I collect books from and about this era and recommend you add this on to your collection. Max Arthur's book covering the Great War is quite unique in that its content is nearly all first-hand accounts from people who experienced the horror of the Great War. The author has utilized a number of tape recorded interviews conducted by the Imperial War Museum in 1972. Many of the tapes from the Imperial War Museum Sound Archive had been forgotten and left unheard for years. I was really taken by these segments and I found it hard to stop reading. The accounts from these soldiers and civilians alike were at times humorous, strikingly direct, horrifying and on many occasions quite sad. I was really taken in by these accounts and I don't think that any World War One library would be complete without this title sitting on the shelf. I can honestly say that I learnt quite a few things from this book and I would place it along side such works offered by Lyn MacDonald. 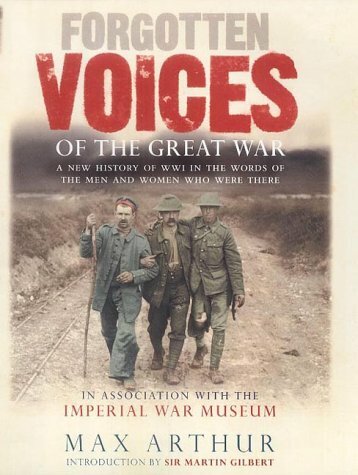 Well done to the author and the Imperial War Museum for allowing these veterans, many now long dead, the last word on their experiences in the Great War. This is a great book, you won't be disappointed.